Lara and Holly tend to do a lot of jigsaws or play a lot of board games after school these days but I had been starting to feel that they are both out-growing our collection of jigsaw puzzles; thankfully, Ravensburger have reminded me that jigsaws don't just have to be for tiny people to learn problem-solving skills, but are also a great source of fun challenge for older children and this 200 piece My First Pet jigsaw has really got Lara back into puzzles. 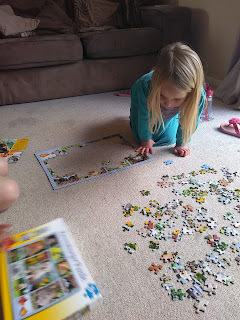 Over the past week Lara has been working on this puzzle a little bit at a time. It is a large puzzle about 40cm by 36cm when fully made. With 200 pieces and a fairly complex design, it took Lara about three evenings to complete. The design was very much admired by both my girls so I often found Holly helping out her sister. They both quickly grasped that the blue and white gingham design wasn't just around the edges, but also throughout the jigsaw between each animal. The design features lots of different cute pets from a chincilla to a terrapin and a hedgehog to a pony. We particularly like the sleepy kitten. Given the size and the length of time to construct, we got the girls to move the puzzle onto a board so that we could move it out of the way when needed - this is the first time they'd used a puzzle board and it worked really well. The finished design looks really grand on the board. 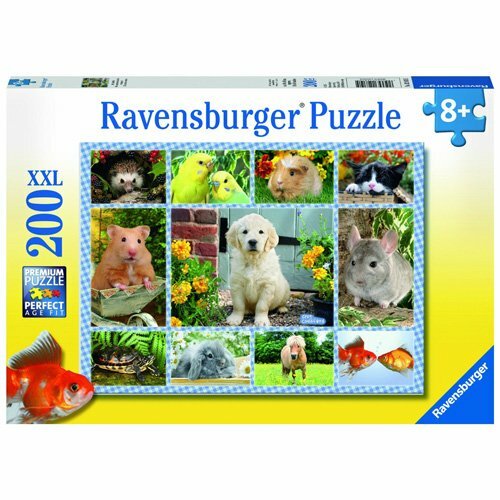 This My First Pet XXL Jigsaw jigsaw costs less than £10 on amazon and is of the same great quality that I'd expect from any Ravensburger puzzle. I'm expecting the girls to be constructing this one many many times over the coming years. It is recommended for children from 8 years old but I think an adventurous 5 year old like Holly would also enjoy it if they have the staying power!